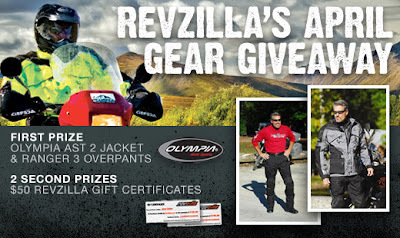 April 2011 Gear Giveaway - Free Olympia Gear! For April 2011, we are extremely excited about our monthly giveaway. Brand new for Spring 2011, the Olympia AST 2 Jacket and Olympia Ranger 3 Overpants are successors to two immensely popular all-season touring pieces from Olympia. Both jacket and pants have seen some significant improvements over their past iterations and it is no doubt that this will prove to be some of the most popular gear at RevZilla.com this year. Entry to win is simple and by doing so, you'll be automatically eligible to win our gear giveaway every month. Simply visit www.RevZilla.com/win and quickly create a rider profile to have your shot at a free Olympia setup this month, and a chance to win gear every month after that! Visit Official Contest Rules for all the nitty-gritty.